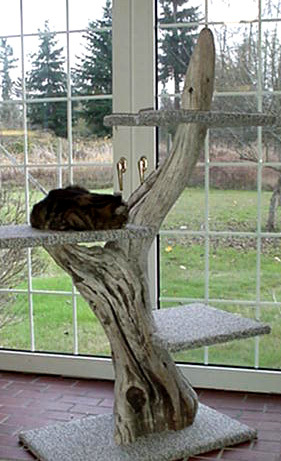 The cattery is the windowed portion of the barn. The whole of it measures 15'x 30', split into four rooms. The rest of the barn has three 10'x 15' dirt floor stalls, a 10' center aisle, and two stall-size bays for tractor, storage and storing foodstuffs, litter, and all the other etcs. The big room is 14'x 15'with the double set of windows, and has "The Dominator" cage in it. We had to put it together in the room because it's 4' deep; I have to crawl in to clean it thoroughly. I have it separated into two sections with plexiglas, which is nice for introducing girls to boys. Since it has legs, there is room under it to store carriers, turbo tracks, and the vacuum. 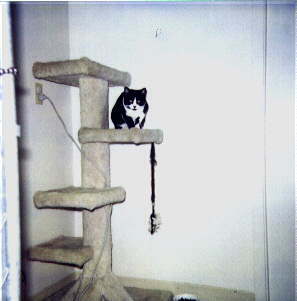 There is room for a desk with a combo TV/VCR/FM radio, one or two Tokyo cages, the big climber, and the carpeted park bench. The phone is in this room, so when someone calls I am invariably in the back room! This room has a wall heater, and rosettes hanging around the ceiling! 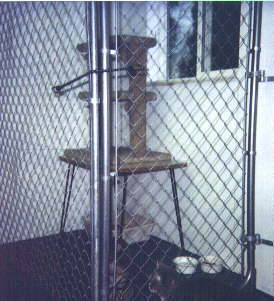 The center room has a chain-link tom cage that includes the window. I hope to someday change that to the same aviary wire as the Tokyo cages. 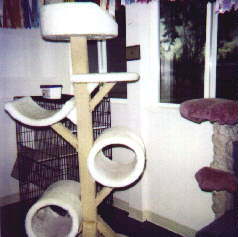 The rest of the room has the smaller climber and room to play. 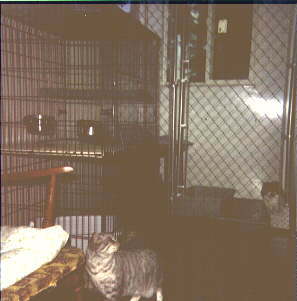 The back room also has a tom cage with window. This room also has a wall heater and a beautiful light switch plate that my husband wouldn't tolerate in the living room. 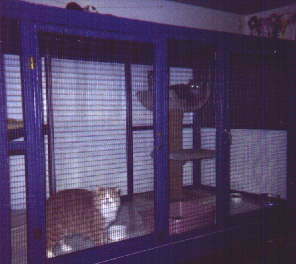 Eventually, I plan to install caging that will be adjustable: able to be either vertical space for adults or horizontal space for moms and litters. However, we like those in the kids' bedrooms! The last room is a service area with capacity for isolation. It is vented to the outside. The bath sink, water heater, refrigerator, and toilet are in here. More plans include adding outdoor areas accessed through windows and/or pet doors. This is actually in my house, rather than out in the barn. It's so cool, I just have to show it! 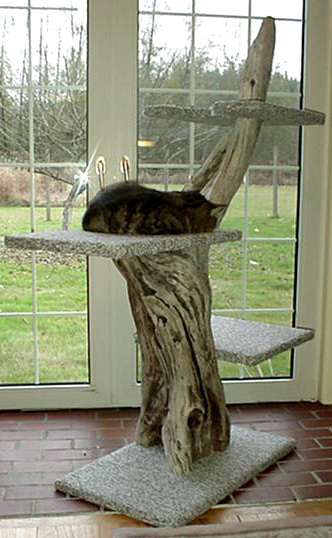 I have found more driftwood cat trees! 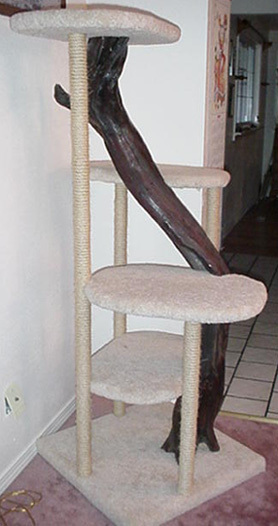 This is about the coolest piece of wood yet!! Made by Mark Phoenix, visit his site. This is Weedeater, our Toggenburg neutered billy.